Movies based on actual events tend to announce their historical bona fides at the outset, knowing that audiences are often more affected by a story when they know that it really happened (even if they may suspect that it didn’t happen quite as depicted on screen). 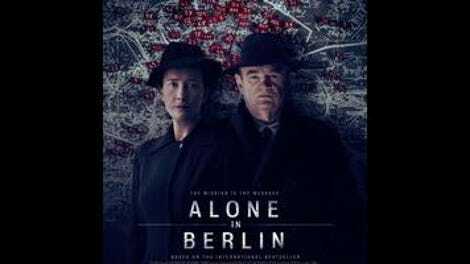 Alone In Berlin features no such opening text, perhaps because it’s technically based on a novel: Hans Fallada’s Every Man Dies Alone, originally published in 1947 (but not translated into English until 2009). 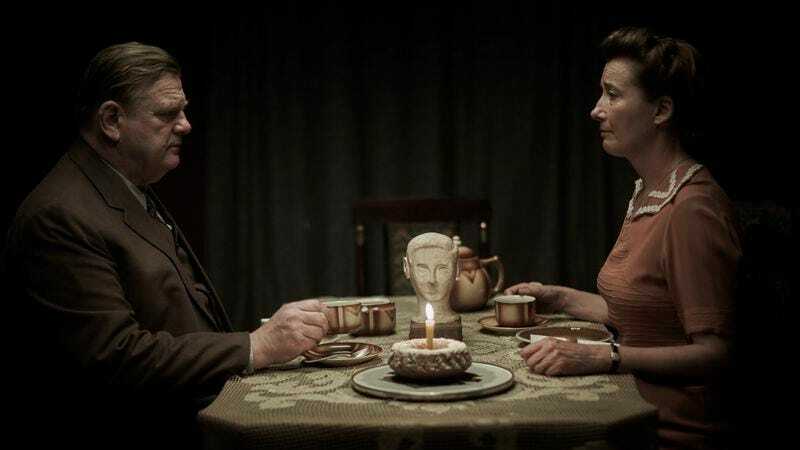 Fallada, however, was directly inspired by the lives of Otto and Elise Hampel, an ordinary German couple who jointly disseminated anti-Nazi literature (of a sort) during World War II, evading capture for two years. You should know that going in, because a lump in the throat inspired by real-life heroism is all that this dour, monotonous drama has to offer. Indeed, it’s easy to guess that the story is fact-based—it’s far too blah to have been invented from scratch. The Hampels’ anger at the Nazi party was apparently provoked not so much by ideological horror as by the death of Elise Hampel’s brother while fighting in France. In both novel and film, it’s the couple’s only son who’s killed, lighting a fire within mild-mannered factory foreman Otto Quangel (Brendan Gleeson). Although Otto seems to take the news dispassionately, he soon begins writing anti-Nazi messages on the backs of postcards, leaving them in random locations all over Berlin. Otto’s wife, Anna (Emma Thompson), insists on helping with the distribution, even though there’s little doubt that both of them will be executed should they be caught. Which they likely will be, eventually, as Inspector Escherich (Daniel Brühl, wearing a fuller variant of Ron Burgundy’s mustache) is hot on their trail. You know this is one obsessed cop because his office wall has a map with dozens of pins stuck into it, signifying locations where the Quangels’ postcards have been found. All that’s missing are the connections made with yarn. To be fair, that’s a genuinely useful investigative strategy (for once), given that there’s no other evidence apart from the handwriting on the cards, which Otto laboriously disguises. But Escherich, despite being dogged and ruthless, also winds up torn between his professional duty and his growing admiration for his quarry, in ways that feel baldly contrived. Likewise, a subplot involving the sad fate of a Jewish neighbor in Otto and Anna’s building seems shoehorned in, largely as an unnecessary reminder that Nazis are bad. It’s possible that Fallada’s novel, written in the war’s immediate aftermath, digs more deeply into the context surrounding the central couple; on screen, however, these interludes are so clumsily handled that they serve only as a recurring distraction from the Quangels’ dangerous mission. Even that mission is more admirable than exciting, at least as portrayed here. Alone In Berlin was co-written and directed by Vincent Perez, a Swiss actor (best known in the U.S. as the star of The Crow: City Of Angels) who evidently equates “serious” with “drab.” In theory, the relationship between Otto and Anna should be the heart of the movie, but Perez has Gleeson and Thompson perform in opposing registers, with Thompson cranked up to 11 and Gleeson dialed down almost to zero. (Both also speak in English with German accents, like everyone else in the film—a convention that now seems really dated.) There’s little sense of a shared worldview, or even of a shared loss, until the final minutes, by which time it’s too late. Nor does Perez solve the significant problem of how to derive visual interest from a resistance plan that consists entirely of writing on postcards and then leaving the postcards on people’s doorsteps. (He leans heavily on montages.) The risk of being observed yields a bit of mild tension, but this is fundamentally a stodgy affair, lent weight mostly by the knowledge that it actually happened. “Based on a true story.” Now you know.